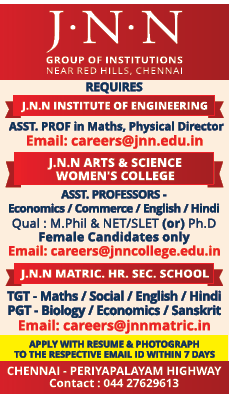 J.N.N Matriculation Hr Sec School, Chennai has advertised in THE HINDU newspaper for recruitment of Teachers PGT / TGT jobs vacancies. Interested and eligible job aspirants are requested to apply within 07 days from 26th August 2018. Check out further more details below. How to Apply: Interested candidates please email application with updated CV to the email address given below within 7 days. Reference: Recruitment Notification / Career Job Opportunities notice for Teachers PGT / TGT Jobs on Hindu newspaper Dated 26th August 2018.